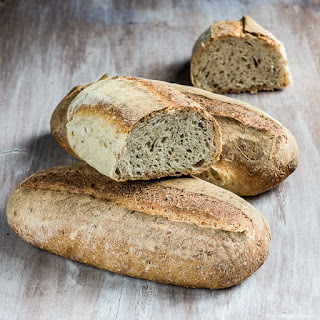 Oh, how I love this bread ... a chewy white crumb, a lovely color and texture and a taste that leads your mind to the country side. 8:15AM Mix all ingredients together for 15 minutes, using a standing mixer. 8:25AM Cover the bowl with a lid and let it stand at 24ºC. This is the bulk fermentation phase. 12:50PM Divide the dough in 3 and shape 3 oblong loaves. 13:05 Put the dough in bannetons and cover them linen towels. Let them raise for the 2nd fermentation. 14:20 Turn on the oven at 275ºC with the baking stone inside and volcanic stones in a pan under to help creating steam. 15:00 Score the loaves with a blade and put them in the oven on the hot stone. Pour 150ml of water over the volcanic stones to create steam. Bake them for 15 minutes keeping the same temperature. After these 15 minutes, reduce the oven temperature to 220ºC and continue to bake for another 30 minutes. 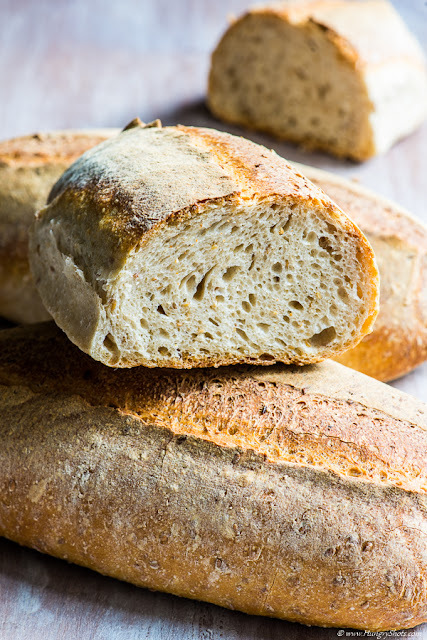 Do you have a recipe for your sourdough starter?